Nowadays direct input interfaces are nearly ubiquitous due to the advent of touch screen based smartphones, tablets, and computers. 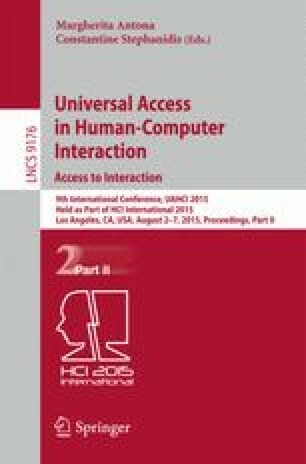 Latency in human-computer interfaces has been discussed since a long time, but established numbers have been questioned in recent research regarding their applicability for direct input interfaces like touch screens. This pilot study focuses on user-acceptable levels of latency in two distinct tasks: simple tapping on interface elements for invoking an action, and dragging tasks to control analog settings. Our results show acceptable latency levels around 300 ms for low attention tapping tasks and around 170 ms for dragging tasks, where visual feedback is essential. These findings are in accordance to previous findings and confirm the importance of considering the task to be fulfilled for drawing conclusions. Financial support for this project was provided by the Austrian research funding association (FFG) under the scope of the COMET program within the research project “Easy to use professional business and system control applications (LiTech)” (contract # 843535). This programme is promoted by BMVIT, BMWFJ and the federal state of Vorarlberg. We also express our gratitude to WolfVision Innovation GmbH for their in-kind contributions.